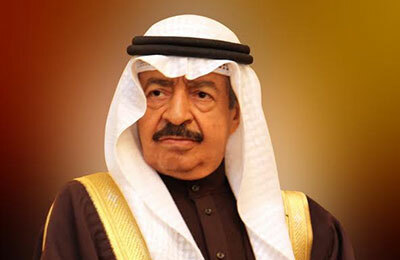 The Vienna-based Peace Promotion Association granted Bahrain’s HRH Prime Minister Prince Khalifa bin Salman Al Khalifa the Flame of Peace Award, making him the first Arab Premier to receive the prestigious honour, a report said. The prize was conferred on HRH the Prime Minister in tribute for his outstanding humanitarian role to promote global peace and boost relations between people, reported Bahrain News Agency (BNA). The Peace Promotion Association, which is presided by Archduchess Herta Margarete Habsburg, decided to bestow the award on HRH the Premier in recognition of his pivotal role in fostering regional and global peace and security as well as his commitment to carrying out the millennium development goals which earned him the UN Millennium Development Goals Award for 2010. HRH the Prime Minister was also honoured for his policies advocating religious coexistence and the use of art to boost rapprochement between people and promote the culture of peace and coexistence, the BNA report said.